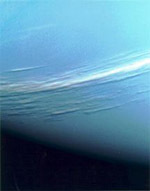 Similar to the giant gas planets Jupiter and Saturn, their smaller cousins, Uranus and Neptune, have long been known to harbor swirling clouds and violent winds churning up their atmospheres. Massive bands of jet streams encircling the entire planet have been observed in both cases. But given that Uranus’ atmosphere is believed to be thick enough to swallow the entire Earth, it was not known just how far the weather perturbations reach into the planet’s interior. 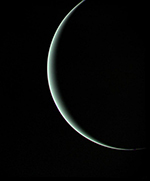 Now a team of planetary scientists with the University of Arizona’s Lunar and Planetary Laboratory, including William Hubbard and Adam Showman, has published the results of new analyses that put an upper limit to the weather zone on Uranus and Neptune. According to their data, reported in the journal Nature, the atmosphere on both planets goes from screaming winds of infernal violence to dead-quiet at a much shallower depth than previously thought. Jupiter, Saturn, Uranus and Neptune. Those are the gas giants, the four heavyweights of the solar system. But was there once a fifth? Maybe so, says a new study by David Nesvorny of the Southwest Research Institute in Boulder, Colorado. He used computer simulations to explore what the solar system may have looked like some four billion years ago.